Fort Polk, Louisiana – Between 700 and 750 wild horses are “trespassing” on Fort Polk, and the Army has implemented a plan to move them off the base. Course of Action 7 (CoA 7), authorized by base commander Brig. Gen. Gary M. Brito, will be implemented immediately. 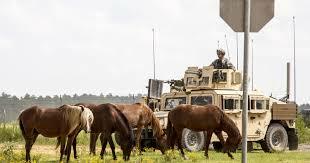 The army states the horses must be removed to allow the critical training that occurs on the base without interference from the horses and for the safety of the soldiers. CoA 7 commands that the wild horses be corralled 20-30 at a time. The captured horses will be offered first to 501(c)(3) animal welfare organizations. If no organization takes the horses, they will be offered to any citizen who will take them. Should no one take the horses, they will be transported to an auction and be sold. The time frame for each group of horses is 30 days from capture to shipment to the sale barn. “This plan gives all interested parties the opportunity to be involved in helping the Army solve the problems it faces. For this program to work, we need your help. We look forward to working with interested parties to help these horses find permanent homes while making Fort Polk a safer place for our Soldiers to train,” said Brito.